The Professional resonator banjo combines classic pre-war style features and desirable modern touches to create the ultimate bluegrass banjo. This model features a mahogany resonator, mahogany neck, bound ebony fretboard, American Standard thread hardware, 20-hole tone ring and a 3-ply rim. Designed by Greg Rich, this model recalls the most supremely crafted banjos from the Golden Age of musical instruments.The Professional features the traditional Recording King floral peghead and inlay and an authentic Mastertone-style flange. 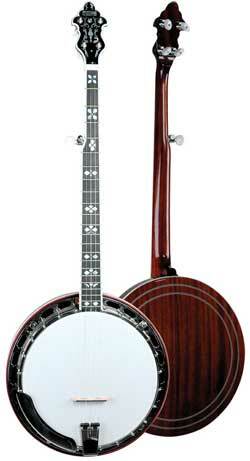 With its exceptional tone and handcrafted perfection, this banjo will appeal to players as well as collectors. 2" Genuine suede leather banjo strap with rubberized hook and loop removable adjustment hook. Specify black or brown. Levy's Garment Leather Padded Banjo Strap, 2-inch. Hand-made at Levy's Leathers Limited in Canada. Golden Gate thumb picks are a favorite among guitarists, and have long been the standard among Bluegrass Dobro and Banjo pickers. Priced each. Quality nickel silver picks in different gauges. Great for playing anything! Priced each. Super comfortable fit�stays tight and secure to your finger without pinching or digging into cuticle. Available in Nickel-Silver or brass, and three different blades.